practitioners and the federal judiciary. is one of the largest chapters in the Southeast. We are highly active and welcome your participation. The Federal Bar Association (FBA) is the premier bar association serving federal practitioners and the federal judiciary. The FBA includes more than 15,000 federal lawyers, including 1,200 federal judges, who work together to promote the sound administration of justice and integrity, quality and independence of the judiciary. 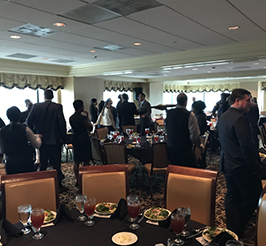 The mission of the FBA is to strengthen the federal legal system and administration of justice by serving the interests and needs of the federal practitioner, both public and private, the federal judiciary and the public they serve. 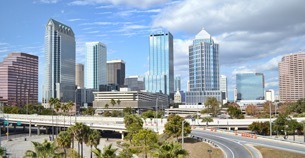 The Tampa Bay Chapter of the FBA is one of the largest chapters in the Southeast. We are highly active and welcome your participation. 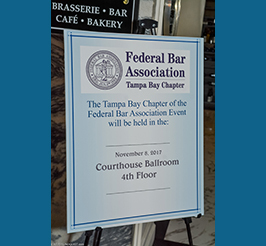 The Federal Bar Association (FBA) is the premier bar association serving federal practitioners and the federal judiciary. The FBA includes more than 15,000 federal lawyers, including 1,200 federal judges, who work together to promote the sound administration of justice and integrity, quality and independence of the judiciary. The Tampa Bay Chapter is online everywhere! Like us on Facebook, follow us on Twitter, and connect with us on LinkedIn. Enhance your digital presence and stay informed of all the latest doings at your Federal Bar. 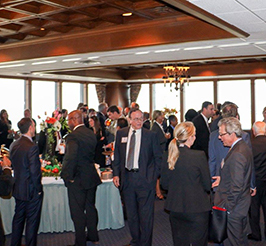 From ongoing events to social media to right here on our website, your Federal Bar is always looking for ways to connect and communicate with you. Have a request, need more information, or just have something to tell us? Fill out the form below and click Send Message to let us know how we can best serve you.